1.The machine returns back to original position once the fabric is run out. 2.The machine will automatically stop once it is without operation over 5 minutes, so it is green, safe and energy saving. 3.When emergency stops, there is no deformation for the spread out fabric. 4. The streamline appearance can reduce wind resistance, noise and vibration. 5.Adopt automatic spreading system and use design of air flotation and guide rail. 6.Use microcomputer integrated control system. 7.To operate by means of man-machine dialogue. 8.Use computer intelligent control to spread fabric tensionless. 9.The icons are easy to learn and understand, which are visualized and simple to operate, so that can improve production efficiency and ensure quality. It applies to T-shirt, children's clothing, leisure wear and fabric of toy, and it can solve the edge curling problem of knitted fabric efficiently. 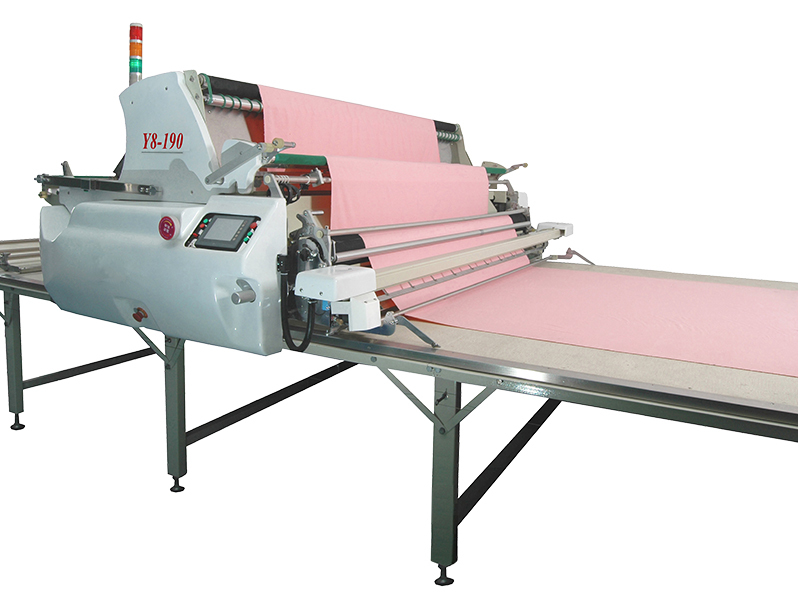 Across flats of precision can achieve ± 0.5 cm, with servo system, it can automatically adjust the tension of fabric and cut pieces even or zero. With high efficiency and smooth spreading, it can achieve one-man operation easily.